Adam Feltz joins the Department of Cognitive and Learning Sciences as assistant professor. He comes to Michigan Tech from Schreiner University, where he was an assistant professor. Feltz received his PhD in Philosophy from Florida State University, as well as a MS in Philosophy from Northern Illinois University and a BS in Philosophy from the University of South Carolina. Feltz is a member of the Cognitive Science Society, Society of Judgment and Decision Making, and the American Philosophical Association. He published in Consciousness and Cognition, Journal of Bioethical Inquiry and the American Journal of Bioethics. His areas of specialization for research and teaching are philosophy of mind, applied ethics, and psychology of philosophical judgment and intuition. Kelly Steelman joins the Department of Cognitive and Learning Sciences as assistant professor. She comes to Michigan Tech from Flinders University, where she was an honors thesis co-advisor and postdoctoral researcher. Steelman received her PhD in Psychology and MS in Human Factors from the University of Illinois at Urbana-Champaign. She also received a MEng in Mechanical and Aerospace Engineering and a BS in Aerospace Engineering from Illinois Institute of Technology. Her research interests are basic and applied attention, models of attention, human performance in aviation, instructional design and display design. She has been published in Human Factors and Psychonomic Bulletin and Review. Image from WTIP 90.7 FM. One of our graduates and current grad student in the MS in Applied Science Education program, Matt Zimmer, was recently honored by the Michigan Association of School Boards (MASB) with one of the Michigan’s Best Awards for Education Excellence. Matt graduated from Michigan Tech in 1999 with a BS in Civil Engineering. 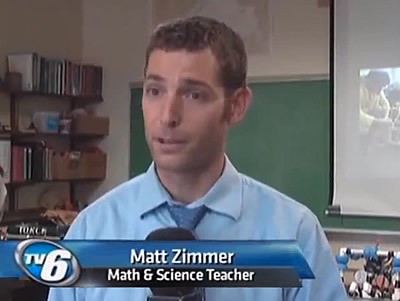 He returned to Tech to get his teaching certification in science, mathematics, and technology & design in 2003. Matt Zimmer and co-Coordinator William Rivest were recognized for their program “Student Organization of Aquatic Robotics (SOAR),” which was selected for an award in the Community Engagement category of the 2013 Education Excellence Award. The program was introduced to the Dollar Bay High School and Dollar Bay-Tamarack City Schools. SOAR designed, built and programmed two remotely operated vehicles to be used by Isle Royale National Park rangers to gather data on invasive zebra mussels. 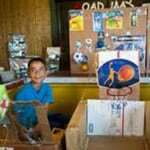 The project provided students with real world applications of math, science and engineering. In addition to being honored as an Education Excellence winner in the spring, each winner received the coveted “Eddy” statue and a check for $2,500 from SET SEG School Insurance Specialists, exclusive sponsor of MASB’s Education Excellence awards program. SOAR also earned the national George & Helen Hartzog Award for Outstanding Volunteer Youth Group in 2012. They were interviewed by WTIP 90.7 FM and Upper Michigan’s Source. Learn more about SOAR and other award winning educational projects at the MASB website. Twenty-five students make up the Student Organization of Aquatic Robotics, or SOAR, and have been awarded the national Hartzog Award for volunteer service. Read more at Upper Michigan’s Soruce, by Sarah Blakely. “I think it’s absolutely phenomenal, and then the fact that they’re designing these things, not just to win a competition, but they’re designing them to help other people, is truly a testament to their will and drive to improve and make the community that they live in better,” said Matt Zimmer, teacher. Read more at Upper Michigan’s Source, by Gabrielle Mays. Katrina Ellis is a Fall 2013 recipient of the Outstanding Graduate Student Teaching Award in the Department of Cognitive and Learning Sciences recognizing her teaching performance. The department nominated her for this award. A certificate of recognition for this award will be presented at the Graduate Research Colloquium Banquet that is held in the spring. Ellis is a PhD student in Applied Cognitive Science and Human Factors. Her advisor is Edward Cokely. Come to the Great Lakes Research Center(GLRC) on MTU’s waterfront campus for an exciting day of activities that will increase your student’s knowledge of Great Lakes science and engineering! During each half-day session, students will attend four 35-minute activities. 2013 Water Festival made possible with funding from Michigan Space Grant Consortium, MTU Center for Water & Society and Great Lakes Stewardship Initiative. Coordinated by the Lake Superior Stewardship Initiative and Michigan Tech University. Learn more at the Western UP Center for Science, Mathematics and Environmental Education. The goals of the Water Festival are to motivate high school students to study STEM fields in college, to introduce them to a variety of STEM and Great Lakes-related careers, to encourage Great Lakes stewardship and to showcase Michigan Tech’s new Great Lakes Research Center. More than a dozen scientists, students and representatives of groups involved in Great Lakes conservation will make presentations to the high schoolers. View photos at the College of Engineering Blog. 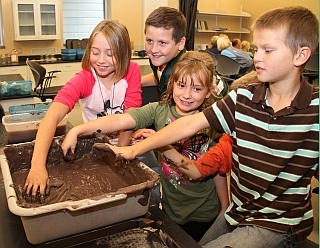 Michigan Tech’s Western UP Center for Science, Math and Environmental Education is inviting children in grades 1-7 to spend six Monday afternoons after school learning about science and engineering. Classes for grades 1-3 begin Monday, Oct. 14 and run through Monday, Nov. 18. Children will design and build wind turbines and engineer animal sounds. 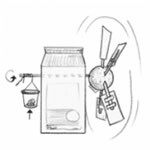 Assistant Professor Adam Feltz (CLS) and Associate Professor Edward Cokely (CLS) have published a new paper entitled Predicting Philosophical Disagreement in the journal Philosophy Compass. Many area schools participated in a teachers’ in-service day on October 11, 2013. The Western UP Center provided a fun day of science activities for students in grades 1-6. 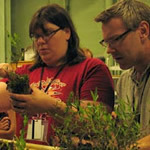 Carrie Wilkinson, a science teacher at Grayling (Mich.) Middle School, may begin one of her science classes this fall by showing students how to make “a bog in a bottle” — one of the take-home projects resulting from a week at Michigan Tech’s summer Teachers’ Institute on Global Change July 8-12, 2013. During the 5-day institute, Wilkinson said she was learning a lot about exposure of soils and peatland to the global carbon cycle and hoped she could apply this new knowledge in her classroom. Read more at Keweenaw Now, by Michele Bordieu.